Soil health specialist Jay Fuhrer. Photo: Laura Rance. Originally published November 9, 2018 in OrganicBiz. It’s a dirty business, teaching farmers about soil — enough to drive Jay Fuhrer to eating cheese balls. 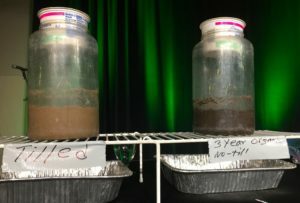 As the “soil health specialist” prepared his show-and-tell before a Saskatoon audience recently, he joked the only reason he buys cheese balls at his local grocer’s is because they come in a perfect-sized jar for the tests he was about to perform. His point? You don’t need to be a scientist with a fully equipped laboratory to assess the health of your soil or measure the impacts of management practices on a farmer’s most important resource. With the aplomb of a magician, Fuhrer poured water over two clumps of soil suspended by netting in the cheese ball jars. One came from a field that sees regular tillage, the other from a field that had seen no tillage for three years. The clump of soil from a tilled field quickly disintegrated, turning the water muddy. The water’s surface quickly became coated with a scum-like film, which Fuhrer later described as the “glue” or glomalin produced by fungi that holds healthy soils together. The clump of soil in the other jar remained intact, even after an hour sitting in water. The water remained clear with no evidence of breakdown or scum (see photo below). Fuhrer later conducted another test in which he measured the levels of nitrate in water after it had been poured through soil that was tilled and soil that wasn’t. There were much higher levels of nitrate, a major contaminant of rural water systems, in the runoff water from the tilled soil. 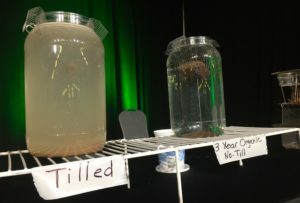 These were simple, visual demonstrations that left no doubt about how tillage breaks down soil over time, leaving it devoid of living organisms, incapable of absorbing water and vulnerable to erosion. He encouraged the 300 farmers in the room to go home and try these tests and others on their own farms to see for themselves. Fuhrer, who works for the USDA Natural Resources Conservation Service in Bismarck, North Dakota is speaking to sell-out crowds in meeting rooms across the Northern Great Plains these days — not so much because he’s bringing new revelations to the discussion — but because of his ability to digest the complicated world of soil science into simple concepts with practical applications. 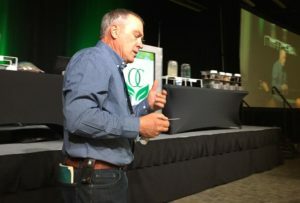 Although he was speaking to farmers attending the recent Organic Connections conference in Saskatoon, Fuhrer is agnostic on the debate over which farming system is best. He knows full well that economics drive farmers’ decision-making and he understands how approaches that involve short-term pain for long-term gain can be a hard sell. He struggled with that himself over the past 38 years working with farmers in soil and water conservation. “For me, the economics of the whole thing depends on how long you want to farm,” he says. He talks to lots of farmers who say their grandfathers were great farmers, their dads did OK and they are struggling. He says the answer to that riddle lies in their soil. Many of the ills plaguing modern crop farmers — erosion, salinity, declining fertility, water-quality issues, the occurrence of droughts and floods in the same year — are “classic symptoms” of degraded soils, he says. It’s a simple concept with complicated implications. Everything that farmers do in annual cropping — whether it is the crops they choose to grow, removal of seed, removing the straw, or land management practices, is about extracting resources. He promotes practices based on the basic principles required for soil health: soil armour, minimal soil disturbance, plant diversity, continual living roots in the soil, and integrating livestock. His ability to draw an audience suggests more farmers are listening and putting his methods to work.